CryoFacials delivered via localized cryotherapy are designed to stimulate the production of collagen and increase elasticity in the skin. It’s a much cooler way to maintain a younger looking appearance! CryoFacials (cryotherapy facials) are our latest service offering to assist clients with their overall health and general well-being. Utilizing localized or “spot” cryotherapy, we directly apply gentle bursts of pressurized, hyper-cooled air to the face and neck region. CryoFacials promote the production of collagen; tightening the skin, increasing elasticity and reducing the size and appearance of pores over time. This process occurs as the surface temperature of facial skin is reduced, causing a natural constriction and dilation of blood vessels during the session. The result is a more even toned, youthful appearance without the use of injections and expensive facial creams. Relief from pain associated with chronic skin conditions. 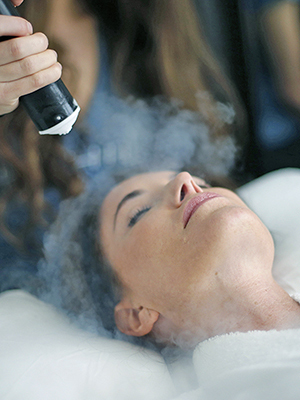 If you’re short on time or your favorite spa is booked, we invite you to schedule a CryoFacial appointment with us. Don’t miss an opportunity to experience the coolest facial therapy of your life!